Recently in an application, I was required to cache some web api calls so I put the OutputCache attribute over the Web API action but when I ran it was not working. The data was not getting cached and on every request, it was going to server and further fetching data from database and returning the same. Then to verify the attribute, I put the same attribute over a MVC action and it was working like a charm. So I felt that it looks like that this attribute is not working. 1- I have created a TestController (MVC) and Index View. 2- Then I am assigning current time in ViewBag and displaying in the view. As here we can see that the time is not getting updated after multiple refreshes. This is very expected behavior that we want from the attribute. Now let’s See the Web Api part. 1- I created a TestDataController which inherits from ApiController. 2- It has a Get method which return a list of string. Here for simplicity, it contains two items- DateTime in normal and UTC format. 3- Here I also decorated with OutputCache attribute to the Web API method as I did in MVC example. 4- Then I created another MVC action (Details) in TestController and created a View accordingly. 5- Now from the Details view, I am calling the web api via jQuery Ajax. Above controller has the same OutputCache attribute. Oh.. here the data is not cached and time is getting updated in every call which is not expected. So clearly we can see in the left side (Red encircled area) that Cache header is set properly which is response header for MVC action, while in the right side, we see that (Blue encircled area), Cache control is set as no-cache. 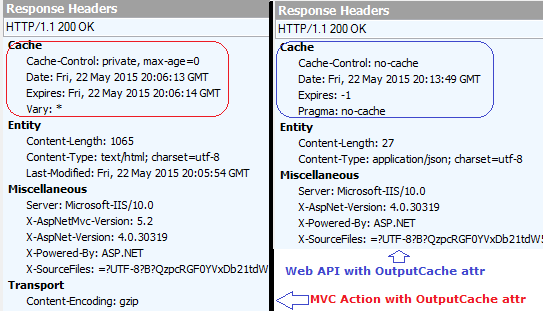 It means OutputCache attribute is not setting the proper cache header in response for web api. Here see the blue encircled area, cache header is set. So this is the reason response is getting cached now. Hope you have enjoyed the post and it has helped you. This entry was posted in ASP.NET Web API and tagged ASP.NET, OutputCache, Web API. Bookmark the permalink. thanks for the post. But i’m wondering is it a bug or by design? 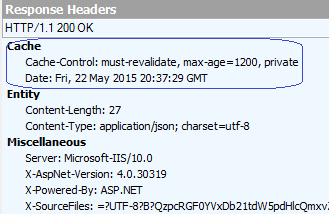 Is there a reason for not setting the correct OutputCache attribute for web api? It is a kind of design issue with Web API. Initially MS provided support for REST with WCF but later they introduced Web API as a part of ASP.NET Stack and tried to make it similar with MVC. But could not make it completely similar as MVC as both required major design change that’s why Web API controller inherits ApiController. But they are changing the complete framework from bottom in ASP.NET 5 and there you wont find similar anomalies. Thanks for your feedback. I have seen that while doing research for this post. I think it would be good if I add in the post for our readers. Actually my whole idea for this post, was to highlight the dependency and the cause. Your are right!! Here I have used the browser’s capability of Caching that was required for in my application. In Web APIs, I have seen use of Browser’s one mainly. It can be extended based on the need as well. Also, the lasted version of ASP.NET Core changed a lot. There MVC and Web API got unified and this feature works exactly same in both cases. I also have to check in ASP.NET Core 1.0 but I am sure it will work as Controllers are same. I dont think it has any relation with OWIN in MVC 5. 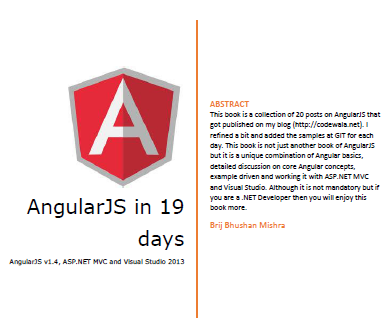 Earlier both the MVC and Web API were implemented differently. That was the key reason. thx for this post. however how can i check if there is a data in the cache , and if there is get the data from cache and not calling the webAPI. When you consume the service via Client side, it uses HTTP Cache control header for caching. The header should be set properly as I mentioned in the post. You don’t need to check anything. Browser itself checks the data in cache and if it get expired then calls to web api for data.